15 Of The Most Memorable Sharks In Video Games - We Love Sharks! 15 Of The Most Memorable Sharks In Video Games - We Love Sharks! 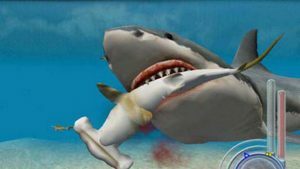 Sharks in Video Games have featured almost as long as sharks in movies. Here are 15 video game sharks you need to know. Though the apex marine predator still evokes a primal kind of fear in most people, we know better. 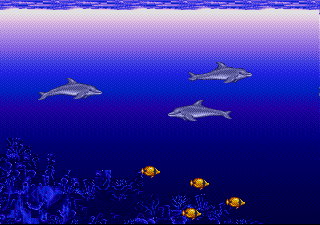 Interestingly, just like in the movies, sharks have been featured in video games for quite some time now. In the list below, there’s something for everyone: from the basic games for beginner players to more complicated ones for the veterans. You should find something to keep you entertained. Here are 15 of our Most Memorable Sharks In Video Games. 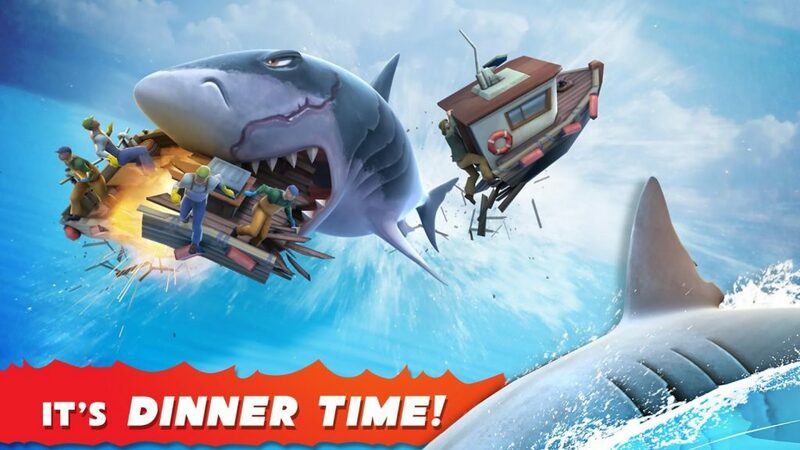 Players get to take control of a very hungry shark that pretty much spends its days on a frantic ocean rampage. You get to survive only by quickly eating everything and everyone that crosses your path. 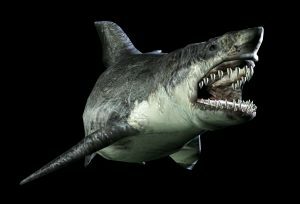 Players will also evolve into different shark species like the great white, hammerhead shark, and the megalodon shark then battle a number of over-sized sea monsters. In this 10th installation of the Legend of Zelda series, Link (the protagonist) has to face many sea-based perils as he sets out to rescue his sister and win the Triforce. One of the many dangers he faces are the purple-finned Gyorgs. These fierce looking shark pops up once Link encroaches on their territory in the Great Sea. Gyorgs are particularly persistent and attempt to knock Link out of his boat by ramming it head-on. They also attack in groups of two to five and will try to bite Link if he meets them in the water. But players can avoid them by staying on course. 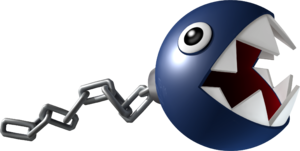 The Chain Chomp is a character in the Mario Party Advance. It looks like a ball with large, sharp teeth that’s attached to a chain. This character enjoys dueling anyone passing by its home and it’s a recurring enemy in the Mario game series. 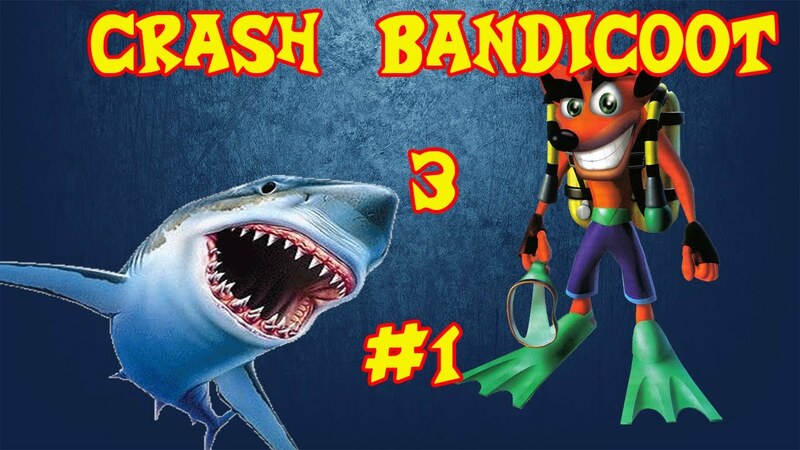 Sharks are constant enemies in the Crash Bandicoot series and this one is no exception. 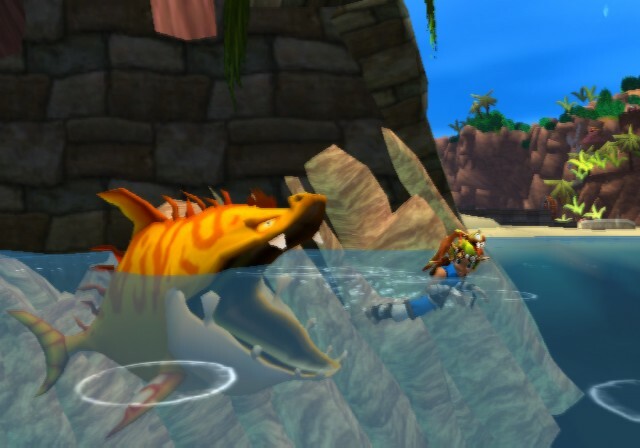 In this game, the shark appears in the water levels (Under Pressure and Deep Trouble). It lies in wait for Crash and will quickly eat him (if it catches him) and spit out his scuba gear. Though, there are worse threats in the game and Crash can defeat the sharks with pretty basic moves. These hulking creatures sometimes attack in well-coordinated groups, constituting themselves into an enemy that’s very difficult to overcome. Ecco (a dolphin) encounters many of them in the Open Ocean level, and these great whites will eat him instantly on contact. Johnny is a robotic shark equipped with a torpedo for a headpiece. He plays the role of a one-time, evil sidekick to the notorious pirate Captain Whisker. 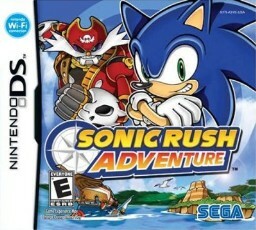 When Johnny is not up to assisting Captain Whiskers in thievery, he engages Sonic in water races for Chaos Emeralds. The character Thanatos is a fearsome-looking great white with large, pointed teeth and a humongous, jet-black and scarred body. Also, he enters with an entourage of sharks. This is easily one of the most terrifying sharks in video games. 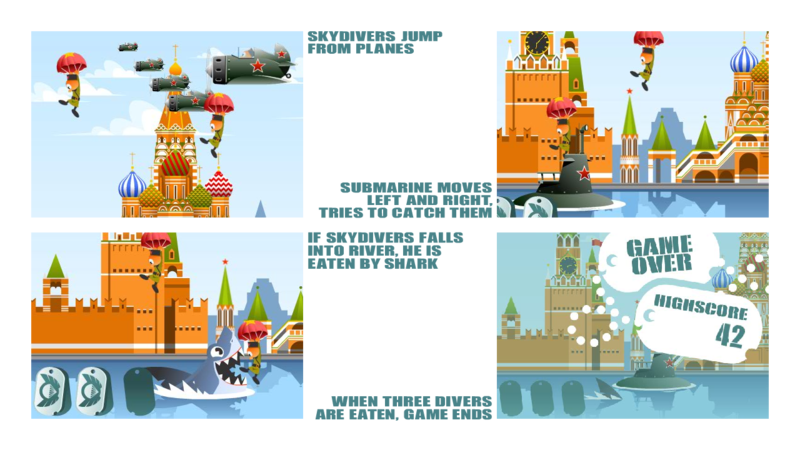 In this basic game, skydivers drop from planes and your job is to catch them using a submarine. Sounds pretty easy and basic till you realize that they are dropping faster than you can move. Worst of all, there’s a hungry shark with very large teeth waiting to gobble them up immediately they hit the water! It’s game over when three divers are eaten. The Lurker shark appears in funny-looking bright-orange but he’s no child’s play. 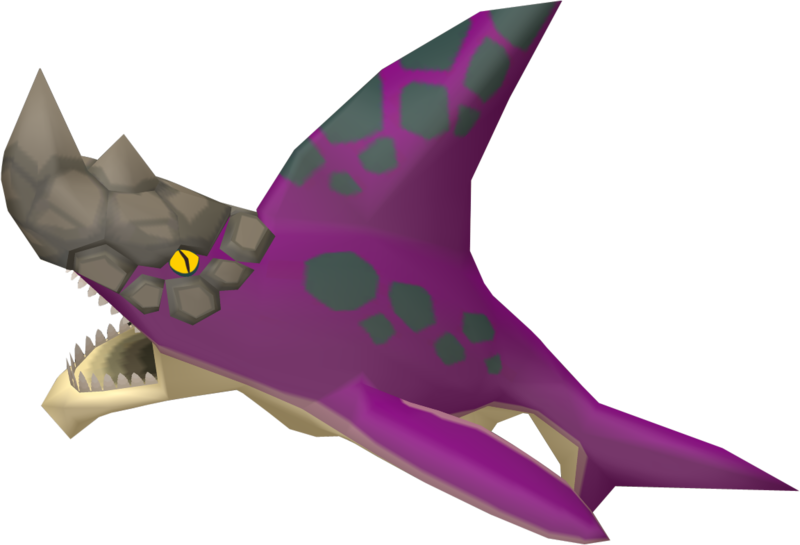 This shark keeps players from straying far out into the open sea. Once you stray too far, the shark roars and follows you in a heartbeat. Players must get back to shore before the heartbeat reaches them or the shark swallows them whole. In other words, they become shark food. This shark is probably the scariest of sharks in video games. After all, what else would you expect from Resident Evil? Basically, you have to kill this mutated and vicious shark (a great white) to move on to the next level. 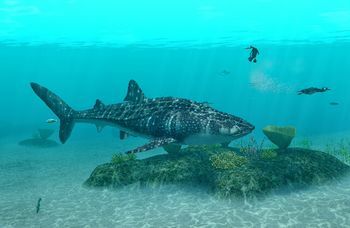 This enormous whale shark requires a host of people to conquer it. 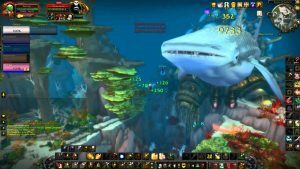 Though totally harmless to humans in real life, in this game the Whale shark is a horrible sea monster patrolling the waters of Vashj’ir. Also, it delights in eating adventurers. 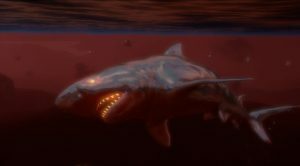 The Cyber Shark in Far Cry 3 is an animal that you certainly don’t want to mess with. Unfortunately, you can’t escape its bright yellow eyes and metallic body. But there’s hope: if you’re skilled and fast enough, you can quickly dispatch it with a laser katana. Or, use a sniper rifle and explosive ammo. However, if you really want to keep things simple, just run them over with your boat. 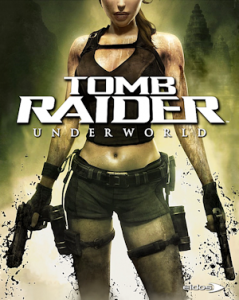 Sharks are a common enemy in some of the Tomb raider series such as the Golden Mask and Underworld. These sharks are a danger to Lara Croft only when she’s in the water and she has several weapons at her disposal to help her get rid of them. It’s hard to take a predator seriously when he’s named “Snacker,” but make no mistake: this is one hungry shark that terrorizes the waters of Treasure Trove Cove and the Rusty Bucket Bay in Banjo-Kazooie. This shark is a constant threat to Banjo and is hard to escape. Once Banjo swims too far from the shore in Treasure Trove Cove or into a fenced-in area in Rusty Bucket Bay, Snacker will suddenly appear and chase him. Of course, Snacker easily swims faster than Banjo can paddle, but Banjo can get ahead quickly by jumping out of the water and using some deterrents against the shark. In this game, you also get to play the role of the shark for a change. The storyline is loosely based on the original 1975 movie, Jaws, and the events also take place on the island of Amity. If you’d get a kick out of eating every other animal in the water and destroying everything in your path, then this game is for you. Oh, and you get to eat a number of humans too! Have you tried any of the above games or encountered other interesting sharks in video games? If so do let us know in the comments.